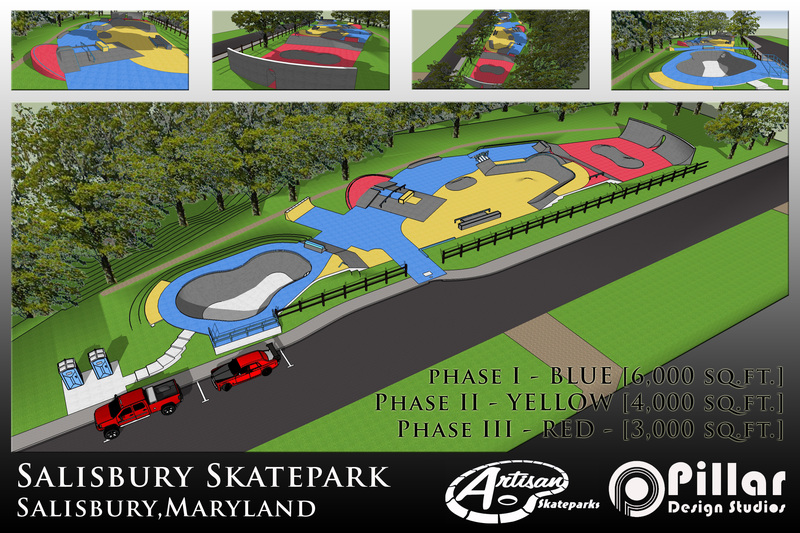 Phase 1 of the new Salisbury Skatepark opened in December 2015. Phase 2-A was recently completed and opened in June 2018. Funding for Phase 2-B, the final phase, is now being sought through the Community Parks & Playgrounds program of DNR.Hours of operation are 8:00 a.m. to dusk – weather and conditions permitting.All individuals who wish to utilize the Salisbury Skatepark must be appropriately registered with the City of Salisbury – Department of Field Operations. Skaters 18 years of age and older must complete and sign a Waiver and Release form and obtain a Salisbury Skatepark registration sticker. This sticker must be displayed prominently on your skating helmet (helmets are mandatory) in order to enter and skate in the park. All skaters under the age of 18 must have the waiver signed by a parent or legal guardian.Salisbury Skatepark registration stickers may also be obtained by mail. Simply download the Skatepark Use Agreement – Assumption of Risk & Waiver and Release form, fill out the form completely, and mail it to the Field Operations Department, along with a copy of your Driver’s License or other photo ID. City staff will review the waiver form to ensure all necessary information has been provided. Once the registration form has been approved we will mail you a copy of the completed form and the Salisbury Skatepark registration sticker. Please be sure to include a working phone number on the form so that we can contact you if we have any questions. A separate Waiver and Release form will be required for each skater in the household, and each skater will receive a registration sticker for their skating helmet.